Some people are born superheroes, others made. Then there’s Shazam, a guy in a goofy suit who manages to defy all the increasingly stale origin story conventions. He’s unique, he’s entertaining and he’s a joy to watch. How much goodwill does Shazam! build up? Put it this way: Despite some flaws with the bad guy and an excess of green-screen spectacle, the surefire crowd-pleaser is easily the best, most complete entry yet in the new DC Comic Universe. Apparently Shazam! has complicated and rather dramatic comic-book roots, and I’m here to confirm that none of that matters. The plot mercifully drops us off in the kiddie pool without judgements. What a relief: We’re already dealing with some 20 complex superheroes in the upcoming Avengers extravaganza. There’s only so much bandwidth in our brains to process everyone’s nuanced paths (and the respective punctuation after their names). Let’s take it away! Billy Batson (Disney channel alum Asher Angel), is a street-smart 14-year-old loner. Miserable in his new, albeit welcoming, foster family in Philadelphia, he longs to find the birth mother that picked up and abandoned him when he was just a youngster. It’s all very Punky Brewster. Then he’s transported to a secret realm where an ancient wizard (Djimon Hounsou) bestows him with powers. 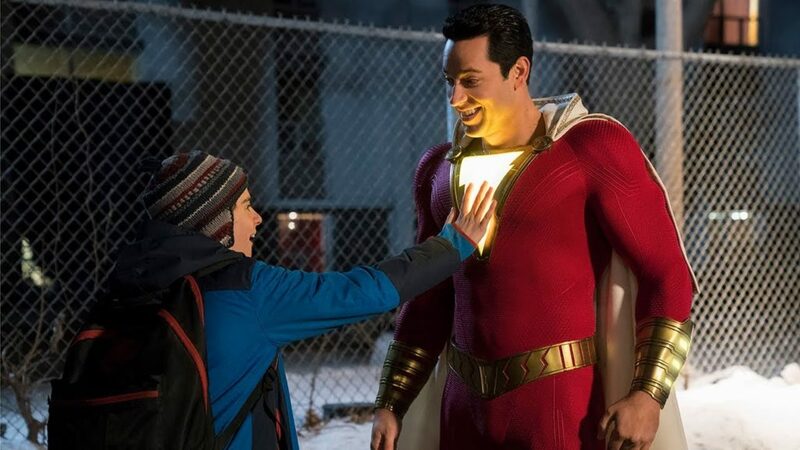 By simply uttering the word “shazam!” Billy can instantly change into an ultra-strong, ultra-fast force-of-nature grown-up (played by Zachary Levi). Half-Spider-Man, half-1988 comedy Big, all heart. Shazam! is also that rare popcorn flick that delivers laughs and a meaningful family-friendly message about working together. As in, it’s not just shoe-horned into the story so the stars can have wide-ranging talking points during the promotional tour. Billy’s new group foster home, led by loving parents, is full of endearingly scrappy young freaks and geeks. Pay special attention to Freddy (Jack Dylan Grazer), a disabled comic-book fanatic and Billy’s partner in anti-crime; and adorable Darla (Faithe Herman), the youngest and most adorable who tries hard to keep Billy’s secret. At its best, Shazam!delivers a bounty of laughs courtesy of its zany comic sensibility. 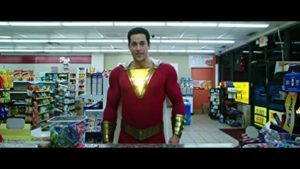 Its strengths are all on display during a delightful montage in which Billy-as-Shazam and a wide-eyed Freddy test out all his nifty superpowers and eventually go viral. (Look, he can charge an iPhone with a single finger-point!) Their friendship is the real deal, as the amiable Levi pulls off the delicate balance of seeming intimidating in stature but awestruck in spirit. His fun is infectious. Too bad the guys’ mission to defeat the megalomaniac Dr. Thaddeus Sivana (Kingsman’s Mark Strong) isn’t quite as smoothly executed. He gets his own sad sack backstory at the front of the movie, yet he’s still underwritten as a one-note killing machine. How many times do we need to see him take off his sunglasses and reveal his evil blue eye? Answer: Zero. A subplot featuring seven deadly sins acting as living henchmen will be lost on kids as well. They look like gargoyles and they’re as intimidating as toy action figures. It’s all a buzzkill that detracts from the fun at hand. Good thing there’s so much fun in Shazam! to spare. And nothing can destroy this big-screen magic.